The species was first recorded in Britain at Box Hill and Kew (Surrey) as long ago as about 1880 and 1898 (Verdcourt 1997). It is found mainly in the Thames valley in Essex, east Berkshire, Middlesex, Surrey (and London), and the Severn valley in Gloucestershire, Worcestershire and Warwickshire. The spider is frequent locally in southern parts of Europe (Roberts 1995), but is absent from Scandinavia. The species is found on bushes in gardens and parks often in suburban areas, but also on scrub in more natural habitats. The spider spins a small web and retreat on the upper surface of leaves of bushes. The leaves of lilac, Forsythia, holly and ivy are especially favoured but any leaves are used with a similar size and curved surface across which the web can be made. Both sexes have been found in Malaise trap samples run in Buckingham Palace Gardens between September and November and females are sometimes found indoors in late autumn. Adults are generally found in late summer and autumn with females persisting into the winter, although both sexes have been recorded in January. The spider can be common in gardens in London and south Essex and is probably widespread and frequent in this area. It has been regularly seen in the Severn valley since its discovery there in 1993. It was perhaps originally imported into Britain (Merrett 1990), but it should be noted that there are other species with a distribution based in the Thames and Severn Valleys, where climatic similarities include average daily maximum and minimum temperatures in January and July (figures in The Climate of England, some facts and figures, The Met Office 1996). The species is unlikely to be threatened since it can flourish on shrubs in gardens, parks and other amenity landscapes. The use of suitable shrubs in amenity plantings should be encouraged. 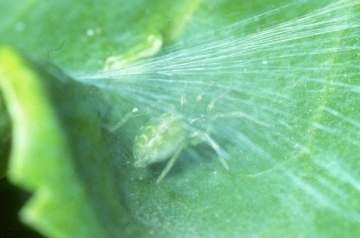 In locations where the spider occurs trimming of hedges and shrubs should be avoided in summer and autumn (when the spider constructs its webs on suitable leaves and lays its egg sacs). A proportion of shrubs should be left untrimmed.